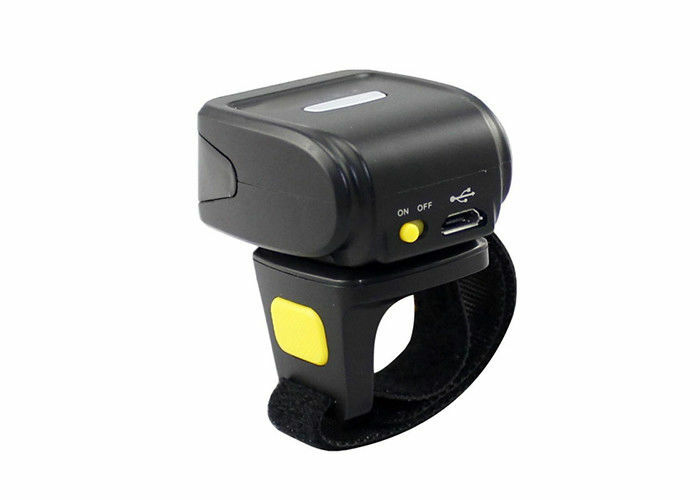 The ring-type Bluetooth barcode scanner RK100 is a new mini barcode reader developed by our company. Working on your fingers is like a golden diamond ring that shocks the audience. The unique shape and excellent application performance make our customers love it. RK100 is a novel, exquisite and portable, long-life ring-type one-dimensional laser barcode scanner that supports wireless Bluetooth operation. RK100 two-dimensional uses a 617 nm LED visible diode with a light source wavelength. It has fast decoding and high-precision reading capability and is highly resistant to ambient light interference. Barcodes on media such as paper, merchandise, and screens can be easily read. The RK100 scanning distance is greatly improved compared with similar products, the scanning speed is fast, the reading performance is strong, and the accuracy is high. Through the wireless Bluetooth communication function, the RK100 allows all kinds of smartphones, tablets, laptops, and desktop computers to read real-time bar code information in time so that your back-end system can be kept up-to-date at all times. ★ All independent intellectual property rights, holding a patent certificate! ★ The size of the prompt tone for successfully reading the barcode can be changed by setting the barcode. ★ You can change the data transmission format, data editing settings, barcode typesetting by reading the setting bar code.